A beautifully put together pair of monitors with a smooth, warm, distinctive and appealing sound. Excellent construction quality. Powerful bass response. Simple DSP setup to help suit the listening environment. Slightly dull high-end. Bass too prominent. For such a new company, EVE has a huge range of monitors. Of the 12 in the series, the SC307 sits two models down from the biggest (the four-way SC408) and is the bigger of the two three-ways in the range. If you read our review of the diminutive SC204 you will already know that EVE is the new company of ex-ADAM CEO and designer Roland Stenz. You'll also know that we really liked the 204. In particular, it scored highly on build quality and the same is true here. "The 307s are beautifully constructed and feel pleasingly solid"
The 307s are beautifully constructed and feel pleasingly solid. 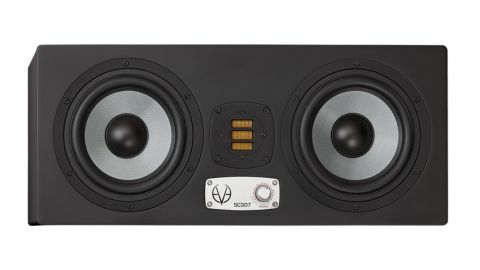 The front panel is simple with its two symmetrical 6.5-inch drivers, central ribbon tweeter and multi-function DSP control. The bass ports are on the rear of the cabinet along with all the audio and power connectors and the three dipswitches for further DSP control. This writer's never been a big fan of ADAM monitors - finding the ribbon tweeters a little too strident in the very high end and consequently tiring over the course of a long day. The EVEs have none of these problems. The high end response is smooth and well balanced with good extension right up to the very top. In fact, our ﬁrst response was that, overall, we found them a little dull. The three-way approach means that one of the 6.5-inch drivers handles everything below 300Hz, the other going up to 3kHz before it hands over to the tweeter. The rear facing ports seem to be very efﬁcient and so the low end response is big and powerful. It's fantastic to listen to but, to our taste, a bit overblown. Compared to other speakers in our studio we felt the bass was too prominent and this meant that the midrange response suffered. "Whatever your taste, the EVE's DSP system does allow for a fair degree of adjustment"
Whatever your taste, the EVE's DSP system does allow for a fair degree of adjustment. That single knob on the front panel controls master level, HF balance and a special 'Desk' ﬁlter (for removing the low mid lump that sitting them on a meter bridge can give you). By simply turning up the high end it all started to make more sense. That extra bit of presence allows vocals and guitars to cut through as they should and then you really start to appreciate the low-end extension Imaging is very precise and the low end is strong and even. Certainly when EQing a bass or bass drum you can really hear what you're doing with no obvious dead spots. Also, as you turn the overall volume up and down, the balance stays the same. Low end detail stays even when they're quiet, which is very important if you're going to spend 12 hours mixing on them. That said, they do go very loud. In conclusion, the 307s are a ﬁne pair of speakers. Sonically they err on the side of the smooth and warm. If you want razor-like precision in the midrange you'd need to look elsewhere but they're certainly a very respectable contender in their particular category. They're well suited to both near and midﬁeld monitoring, very impressive on detail and will undoubtedly ﬁnd favour with a fair few professional users.